Se non fosse per la mancanza dell’igene la casa potrebbe andare. La zona è tranquilla ed è bene collegata con i mezzi di trasporto. Beh... per quanto riguarda la casa lascia molto a desiderare le pulizie altrettanto. L’appartamento può ospitare al massimo otto persone non dieci come afferma la descrizione. Close enough, but not too close. The house is a bit of a walk from the Vatican and a bus/subway ride from the other major attractions. However it is Roman life. Sitting on the balcony watching the traffic below was fun. Grocery stores are near by and a good Pizza/pasta place just down stairs. Beds are good with AC all around. I would stay here again. Property is convenient to everything and is an ideal apartment if you would like to immerse yourself in the life and culture of Rome. We loved the rooftop wraparound terrace and had all ammenities available to us to feel relaxed and comfortable. It is also away from the crowds which made it a peaceful getaway after a long day of exploring. Riccardo and Sara were very accomodating and responsive to our questions. We highly recommend it here! 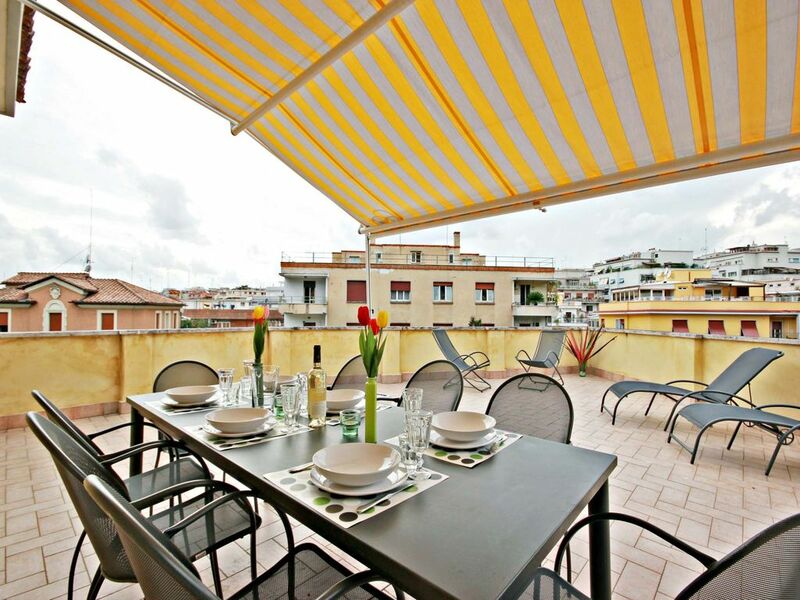 Apartment is well positioned only a short walk away from the much busier areas around Cipro Station, and the Vatican City, etc. The spacious rooftop terrace made for a relaxing space for the family at the end of each day, and a welcome cooler environment from which to observe Roma at night. Property was clean and spacious. Located on a top floor of a building that requires lots of steps to access with luggage, and the building has only an old one person elevator. Location has little to no parking so we spent a lot of time looking for spots and trying to find somewhere to load and unload close to the building. "Air conditioning" was lacking and made for hot nights. Owner was helpful and communicated very quickly. The rooftop deck was nice. Subway station was about a 5-10 minute walk away which allows access to other parts of Rome.